Well, things have changed. 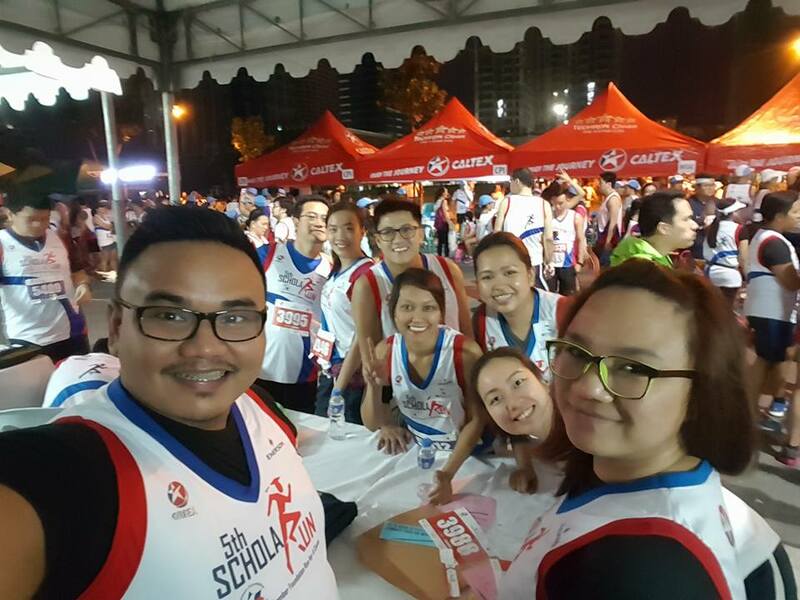 Together with my colleagues, I joined this fun run as part of our company’s charitable activities. It’s the second year our company participated in this event (hell, I had no idea there was something like this last year). 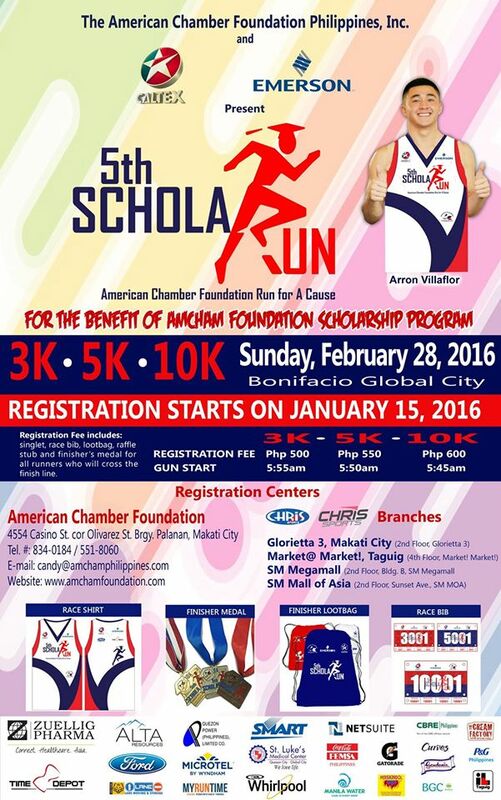 This fun run was hosted by the AmCham Foundation, and proceeds from this event will go to their scholarship program for the education of underprivileged kids. As this is my first ever fun run, I had to prepare physically, mentally, and emotionally for it. I could still remember the first time I jogged in a park with a colleague late last year. After running for less than a kilometer, I was clinging for dear life because I was breathing heavily for precious air. I got tired fast. It was hard for me because I was not really physically active then. Of course I did not make my hardships obvious to my colleague. Haha. But I vowed I would start being active. I needed to start leading a better lifestyle to make my heart healthier and stronger. Since the start of the year, I have been striving to engage myself to physical activities, as part of my goals this quarter (currently brewing a post for more details on this :D) and so far, I think I am finally making some progress. Yay! Part of those activities, which I think will become a regular one, is jogging every morning around our village whenever I was free during the weekends. Yaaay! And that was my first experience for a fun run! There were no muscle ache after (well so far? ), just my body feeling exhausted. I realized I did not drink enough water throughout the race, so I had to replenish my body with fluids throughout the day. I felt that familiar feeling of dehydration throughout the day, which is bad I know, so I drank water whenever possible. For now, 5K is just the right distance for me. 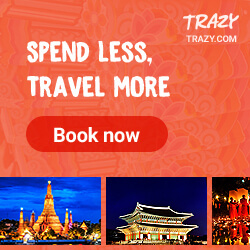 I just cannot imagine myself running for 10K or higher! Here are some reminders/tips for first time runners that I can provide based on this experience, and also to note things down for myself the next time I run again! Bring as few items as possible. There were assigned baggage counters in the event, I was told, but I did not bother locating them. I only had a handful of items with me, and most of them I placed on the jogging arm band that I bought. Insert a towel on your back even before the start of the run. One of my colleagues gave this advice to me. I know this is something done to kids when they play outside, but I guess it’s also applicable for adults. A few minutes after the race, I just pulled it out of my back to allow my skin to breathe again. I just allowed the rest of my sweat to evaporate naturally. Wear drifit clothings! I think this is a must. The fabric would let your sweat evaporate more easily, making you feel cooler and more comfortable. Do a practice jog before the fun run. This is most beneficial to those who are not really active. This is to prepare your body for this activity and will make things feel easier for you during the run itself. Just a caution: avoid doing it a day before the event. This is one mistake I did. For my case, I always had issues with my shin bones. They ache easily whenever I jog for long runs. During the practice jog the day before, my shin bones only ached during my last lap. My body did not have enough time to recover (I think). During the run itself, my shin bones ached within the first minutes of jogging. 😦 I had to endure the pain throughout the run. Good thing I was able to overcome the pain and reach the finish line! With my Fun Run mates!